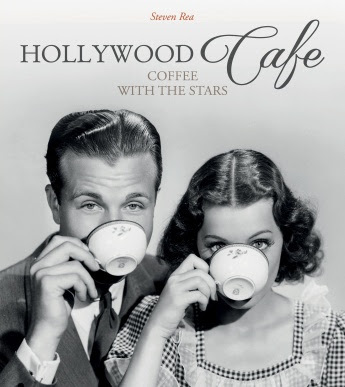 Once I recovered from a dorky burst of giggles inspired by the idea of a coffee table book about coffee, I found that I enjoyed the breezy and surprisingly informative Hollywood Café: Coffee With the Stars. When it comes to classic movies, I've found cocktails to be the most mesmerizing onscreen beverage, but now that I think of it, coffee has also had a significant presence in cinema. In this collection of over 150 images, stars of film, television and radio are seen enjoying the drink behind the scenes and on camera. The opening photo is of java aficionado Preston Sturges drinking from a quart-sized cup. 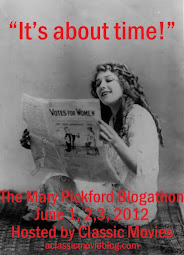 Apparently he has told columnist Rosalind Shaffer that, "he believes coffee drinkers are the real originators of ideas." From there you get Boris Karloff as the Frankenstein monster getting his caffeine fix and Robert Taylor in knightly garb having some joe with the also lavishly-costumed Ava Gardner. There are shots of glamorous stars at humble craft services tables, publicity photos, and stills of key coffee scenes in the movies. Ingrid Bergman is menaced by a line of poisoned coffee cups in a promotional image for the Hitchcock thriller Notorious (1946), Eddie Cantor shills for his radio show sponsor's brand, and it seems every actress from classic Hollywood has been snapped at home in an apron, proving to all that she can brew a great pot of Joe and be just as domestic as the ladies in her audience. While there is no real background here of the history of coffee in Hollywood or the movies, there perhaps isn't much to tell. A cup of java was, and continues to be, an easy way to socialize and revive sagging energy. The drink was simply a fact of life, and here it is shown in galleries organized into categories like the more obvious Silver Service and Waitressing and more intriguing sections like Counter Espionage. Each photo is captioned with a bit of history about the movie and stars in the shot. Some also include the text from the original archival label on the back. I found lots of interesting tidbits in these descriptions. It's all good fun; an excuse to see gorgeous stars in beautiful costumes, reminisce about favorite movies and pick up new titles for the must-see list. There's unabashed fetishism for elegant coffee pots with long, curvy spouts and groundbreaking brewing methods like the Chemex pot and the French press. After looking at your twentieth shot of trim stars noshing on cookies and doughnuts, you wonder how they got away with eating all that sugar. Did they even swallow a bite, or was it all for the cameras? Many thanks to Schiffer Publishing, Ltd. for providing a copy of the book for review.